You don’t have to go it alone. The most experienced Terminal Operating System provider on the planet has already been there and done that. The average terminal is a city unto itself – a jumble of berths, loading docks, automated cranes and transportation vehicles, equipment control systems, yards of containers, integrated gates and tracking systems, all linked into the outside world via rail and trucking connections, and of course, the ocean. These entities and technologies need to be able to communicate with each other, with the buyers and sellers, and also with the back office systems used for scheduling, tracking, billing and invoicing. There can be no gains in efficiency or costs or time savings, much less a boost to competitiveness, otherwise. Connecting these disparate pieces together into one system is not unlike building an enterprise resource planning (ERP) system, which manages and integrates the important parts of a business. In fact, the platform used in terminals to make that happen, the Terminal Operating System (TOS), essentially is an ERP system, for moving and tracking goods in and out of the terminals, says Andy Barrons, chief strategy officer and senior vice president for Navis, a provider of TOS platforms, modules and business intelligence tools. “The TOS is the core system to the heart of the terminal operation’s IT landscape. It’s where the planning and execution take place to make sure containers are moved through the terminal as efficiently as possible, while also making sure that equipment and labor are used as productively as possible,” says Barrons. 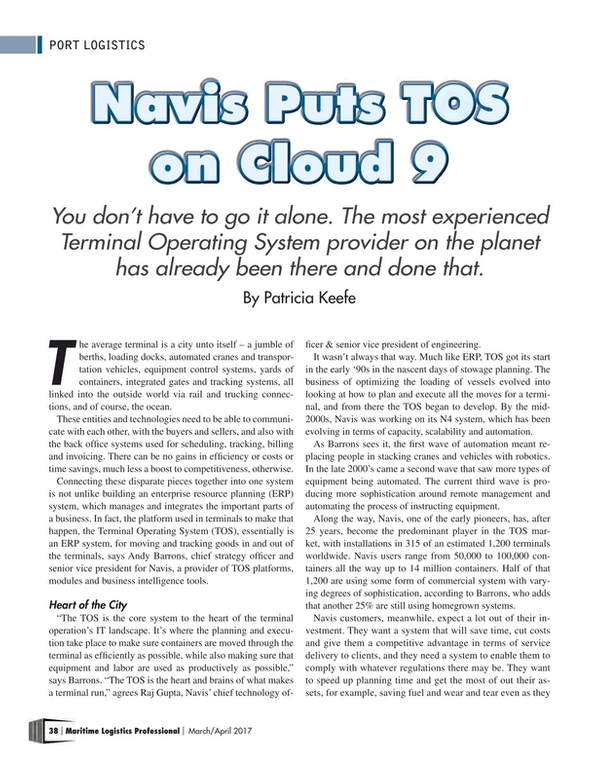 “The TOS is the heart and brains of what makes a terminal run,” agrees Raj Gupta, Navis’ chief technology officer & senior vice president of engineering. It wasn’t always that way. Much like ERP, TOS got its start in the early ’90s in the nascent days of stowage planning. The business of optimizing the loading of vessels evolved into looking at how to plan and execute all the moves for a terminal, and from there the TOS began to develop. By the mid-2000s, Navis was working on its N4 system, which has been evolving in terms of capacity, scalability and automation. As Barrons sees it, the first wave of automation meant replacing people in stacking cranes and vehicles with robotics. In the late 2000s came a second wave that saw more types of equipment being automated. The current third wave is producing more sophistication around remote management and automating the process of instructing equipment. Along the way, Navis, one of the early pioneers, has, after 25 years, become the predominant player in the TOS market, with installations in 315 of an estimated 1,200 terminals worldwide. Navis users range from 50,000 to 100,000 containers all the way up to 14 million containers. Half of that 1,200 are using some form of commercial system with varying degrees of sophistication, according to Barrons, who adds that another 25 percent are still using homegrown systems. Navis customers, meanwhile, expect a lot out of their investment. They want a system that will save time, cut costs and give them a competitive advantage in terms of service delivery to clients, and they need a system to enable them to comply with whatever regulations there may be. They want to speed up planning time and get the most of out their assets, for example, saving fuel and wear and tear even as they work to get equipment like cranes moving at the fastest possible rates consistently so they can optimize the labor working on a particular vessel. They want to provide good service – boosting turnaround time at the gates and also at the berths. They want to be able to manage all this information and provide accurate invoicing. More and more, adds Barrons, they are also looking for transparency and visibility into the TOS data so they can find opportunities to improve operations or identify bottlenecks. “People are becoming more aware of the value of data. If you look at an industry like the airlines, in the ‘90s they lost tens of billions of dollars. They had no control over capacity or their customers coming through travel agents. They’ve controlled capacity over the last decade and also become expert users of data-driven demand forecasting and dynamic pricing. As a result, in the last couple of years, the airlines have made $40 billion,” says Barrons, who believes the shipping supply chain today is on the precipice of a similar evolution. The industry is at a “tipping point,” he says, predicting that the next five to 10 years will see investments in technology around exchanging information and putting data to work. Terminals today have systems managing operations internal to their yard, but, explains Barrons, “the future is having systems that are actually connected to other systems outside your four walls, to share information” between carriers, terminals and all shipping parties. To get to the next level of supply chain efficiency, more focus needs to be placed how different systems integrate across the supply chain. He says this will pose a challenge to sites that have sunk a lot of cost into their in-house developed TOS. “The market today is moving toward automation and optimization – a new level of efficiency. A lot of legacy systems will have to be redeveloped, perhaps from scratch, to manage the level of data required for an automated terminal,” claims Barrons. Those sites will have to decide whether to stay in-house or leverage outside expertise. Undertaking a TOS implementation is not for the faint of heart. It’s a colossal, very complex undertaking, and yet, a substantial number of terminals opted to take the project in-house. In the early ‘90s, when the commercial TOS application market was in its infancy, forward-thinking ports and terminals had no choice – if they wanted to get a handle on traffic, they had to go it alone. Fast forward 20-25 years, and that’s no longer the case as there are a reasonably wide range of commercial platforms to consider. The typical TOS accesses everything through a browser, with the back end running on AWS servers, the clients run on Windows, Linux and mobile phones, and data is stored in Oracle and Microsoft SQL data bases. Only a small number of vendors offer cloud-based TOS today, and they are targeting smaller terminals that lack IT resources. While Navis doesn’t currently extend to intermodal transportation, it has published APIs that can be used to interface to outside systems. Another reason many operators went in-house is that as the saying goes, “If you’ve seen one port, you’ve seen one port.” Ditto terminals. Beyond the basic platform, one size isn’t going to fit all – not without some degree of customization and the use of optional modules targeting specific functional areas. And who knows that port or terminal better than the IT professionals who support it? “Some of the terminals feel the need to create their own TOS because there tends to be many unique (to them) business processes in the way they handle operations. But we are also seeing over time, that many of them are starting to come around to what they can get from Navis. We are able to dedicate a larger set of resources than they can, and the automation we build is not easy to do, and would be difficult for even a larger terminal to maintain.” says Gupta. It generally takes six months to a year to design, install, train and test a TOS system. Done right, it will involve a dedicated team on the terminal side working with the vendor. In the immortal words of Rambo, however, “Nothing is over.” You don’t just get a TOS up and running and settle in. “Buying a TOS is a 20-year commitment,” says Richard Willis, senior director, Port Technologies consultancy. The heavily automated and digitized next stage of that commitment will come with a greater emphasis on data analytics and B2B connectivity and communication. Those two are the keys to providing the insights needed to improve decision making and reduce what Navis estimates to be a staggering $17 billion in annual waste in current port and carrier activities (see McKinsey charts).This includes economic losses from not optimizing stowage, or time savings not realized from not automating, or fuel wasted by sailing too quickly to unavailable berths. The existence of huge areas of inefficiencies across the supply chain have been reinforced, says Barrons, by industry leaders such as Hapag-Lloyd CEO Rolf Habben Jansen referencing “mind-boggling inefficiencies,” APM Terminals’ CEO talking about the need for far greater productivity in terms of predictable vessel turnaround at the port, and, at Maersk’s Capital Market Day in December, Maersk unveiled a new Transport & Logistics division, which it said “aspires to become the global integrator of container logistics, providing global supply chain solutions while delivering great customer experience.” Meanwhile, the focus is off building new vessels and on automation. “Everything that can be digitalized will be digitalized,” said Jakob Stausholm, Maersk’s Group Chief Financial, Strategy & Transformation Officer. But, thanks to better business intelligence tools, “we’ll have a better understanding of that data, the quality of it, what it means, and how to use it to improve cooperation and services,” to eliminate some of that $17 billion in waste, says Barrons. Timely and accurate analysis of real-time data can help to head off equipment issues, improve efficiencies, drive up productivity, push down wait times, and maximize container moves and yard space, as well as provide transparency to customers. On the client side, data analytics can be used to improve stowage planning, enable real-time EDI, cut fuel costs and waiting times, provide greater visibility into where containers are and provide an invaluable assist with contract negotiations. It can even help determine whether and where a yard might have added capacity, leading to more revenue. “A lot of customers, for example, Long Beach Terminal, use TOS [data] to know where to improve operations or improve capacity to bring in additional bookings,” says Gupta. Yet, despite all that effort, time and money, there’s debate over the ROI to be realized. Barrons says a TOS as a core system delivers ROI on many different levels, dependent in part on the individual terminal’s end goals. Willis notes that you could install a TOS and never technically see an ROI, but says that’s okay, because there are other ways of measuring a return on investment. For example, there’s all the money and opportunity being lost because the terminal either wasn’t using a TOS or hadn’t optimized what it was using. There’s the potential for better customer relationships, additional capacity and business, along with using historical data to prevent future problems and to improve worker and machine productivity. While customers work at mastering and stretching a TOS platform and its modules to direct and monitor every activity in every corner of the yard, and to keep partners and clients up to data on where their containers are, vendors are busy too. Over the next 5-10 years, terminal operators can look forward to the ability to dig ever deeper into the operation; expand connectivity out to intermodal transportation; fly higher into the cloud; and, gain better integration with, and oversight of, increasing automation in general, and automated machines in particular, that are coming down the strait. But that’s not enough, according to Navis. “The whole industry is going through a turbulent time with everyone trying to be much more efficient, and that’s what we are working on right now, trying to provide a much more optimized way of getting containers off and on into the yard, smoother, faster, to help them realize the savings right now,” says Gupta. Some of that turbulence is due to vessels getting larger and larger and the shipping alliances that have sprung up. “The capacity is increasing more and more, but the amount of global trade isn’t. When you have more capacity, prices go down. Suddenly it’s not so easy to take a ship out of circulation,” says Gupta. What’s needed to enable this, says Navis, is a global trade, cloud-based digital framework in order to drive a “productivity quantum leap.” Much of the inefficiencies in the supply chain is between parties, not so much within terminals, which have invested heavily in internal systems and improving efficiency in the yard, says Barrons. That “many-to-many” platform, which Navis intends to provide, would bring together terminals, carriers, shippers and cargo owners to easily share and synchronize data, and it claims, “transform how goods are efficiently delivered.” To make that happen, will require “a different type of IT infrastructure, industry leadership and a change in mind set,” says Barrons. At its user conference last month, Navis unveiled what it calls a “broader strategy” that will move the company beyond the terminal yard to also service “a broader set of ocean trade entities.” In addition to its N4 TOS, optimization modules and BI portal for terminals, Navis Carrier Solutions will offer software designed to improve vessel capacity, performance and monitoring, including Navis StowMan, a stowage planning product, with a 25 percent market share, acquired from INTERSCHALT. Also on tap, Navis MACS3, an onboard loading computer, is said to have a 65 percent market share and Navis Bluetracker to track fleet performance. A Navis-backed, but separate entity, XVELA, will provide the cloud-based stowage collaboration network, which is built around open file standards that reportedly will allow network members to move beyond EDI messaging into real-time planning. Network participants will be able to use common vessel visualization tools to support stowage activities using “shared, identical and validated specifications of each ship,’’ to realize new operational efficiencies and “capture untapped savings.” Shared data will reduce the operational data errors caused by outdated or incorrectly configured ship files. XVELA is thinking big. “Replacing fragmented data silos and manual information exchange with digital information hubs connecting multiple parties and processes could have a huge impact on almost every area of logistics and transport,” Navis claims. “You can’t manage what you can’t see,” observed XVELA President Guy Rey-Herme at the announcement. Gupta sees XVELA as functioning more like a B2B online task-based exchange, much like an Ebay or Arribaa, but only for the businesses. Participants will get to see all different parties, how they handle inspections, see what terminals are available, and the terminals can see the carriers’ schedules. The goal, he says, is to make the system of information exchange much smoother and easier to interface. “The challenge with these big implementations is definitely more with the peple and the process change, not the technology you are interfacing with,” agrees Willis. Also on tap from Navis are more and better business intelligence tools designed to enable the business side especially to dig its way out from under the mass of data compiled by the TOS system and shared between supply chain partners. Navis is also working on providing cloud-based services and storage – something some competitors mainly targeting smaller terminals with limited IT and technology support. When they get that into place, the window for upstart competition will continue to narrow. Despite amassing huge silos of data on worker productivity, machine productivity and lifespans, the best approach to stowage, wait times and gate traffic, etc., it turns out that customers aren’t making the best, or even much, use out of that goldmine. They know they should. They know they need to. This is another area where the mindset needs to change, Barrons said.